Hagstrom 8-String Bass H-8 Model Solid Body Electric Bass Guitar (1968), made in Sweden, serial # 723459, sunburst lacquer finish, Baltic birch body and neck, rosewood fingerboard, original grey chipboard case. 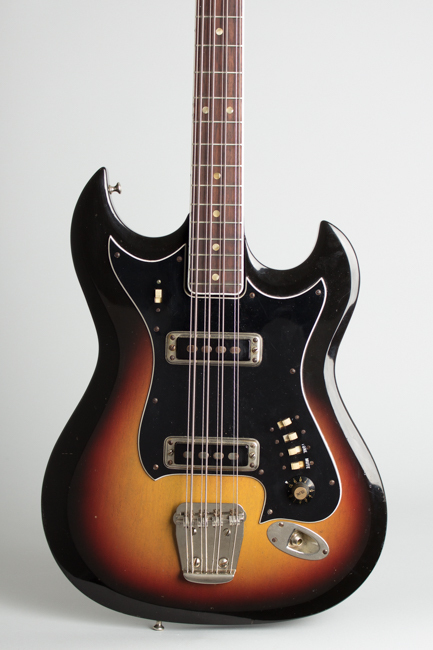 One of the more endearing oddball basses of the 1960s, the Hagstrom H-8 was the only production 8-string bass of the decade (Rickenbacker made a few on custom order) and remains one of the few of its type ever attempted. 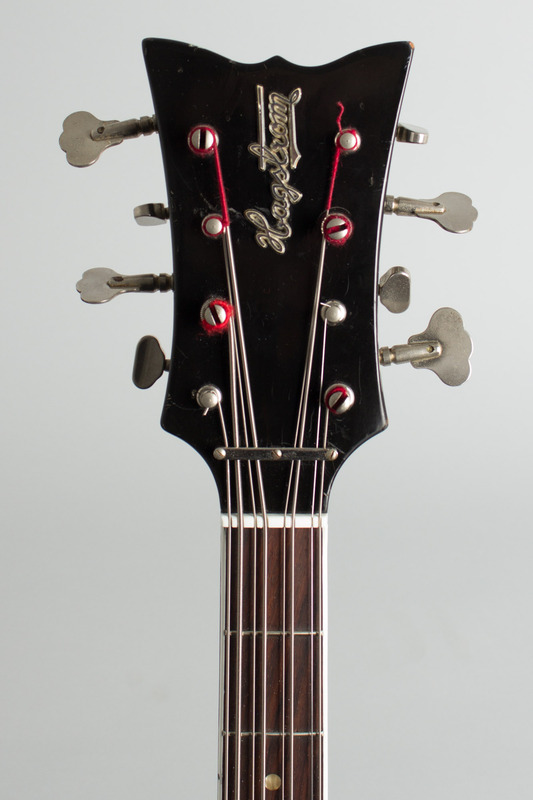 Essentially the bass version of a 12-string guitar, the H-8 is strung in octaves with a higher string above each bass string. The sound is similar to a bass and guitar playing in unison, and can create a very rich tonal effect. 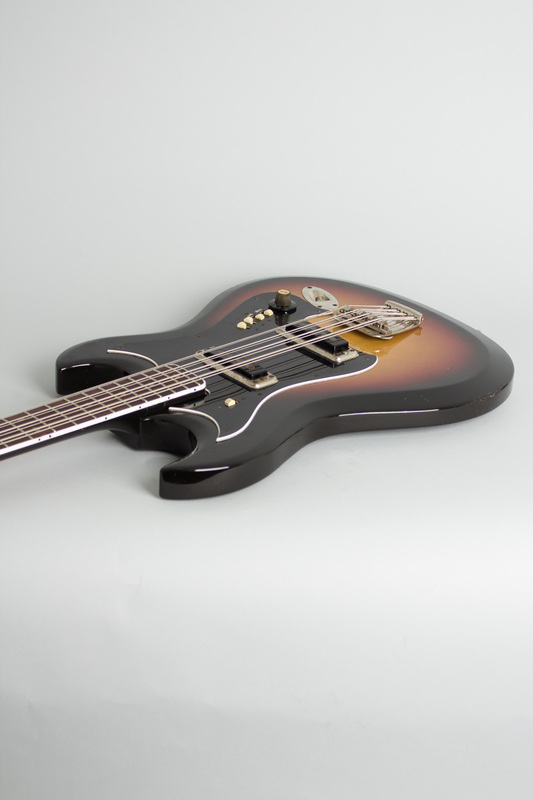 The instrument's features are typically Hagstrom -- a sculpted solid body with very slim neck, and excellent-sounding hi-fi pickups and a bank of slide switches for controlling them. Despite the imposing appearance it's very easy to play, with a standard 30 1/2" short scale fingerboard, low action, and Hagstrom adjustable bridge. 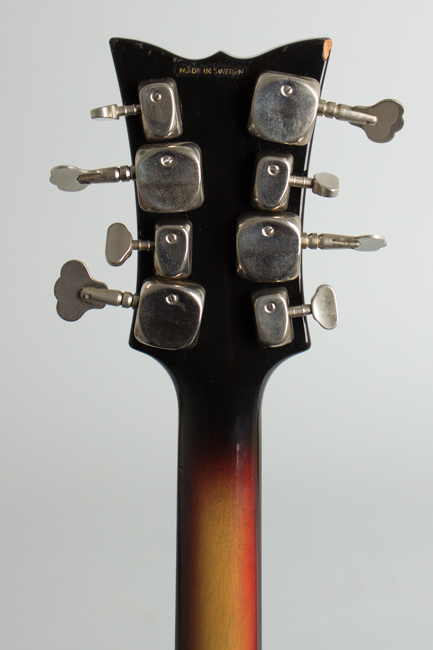 Perhaps the oddest feature visually is the mix of large and small Van Ghent tuners on the headstock. The body is finished in a dark sunburst, one of two color options available. 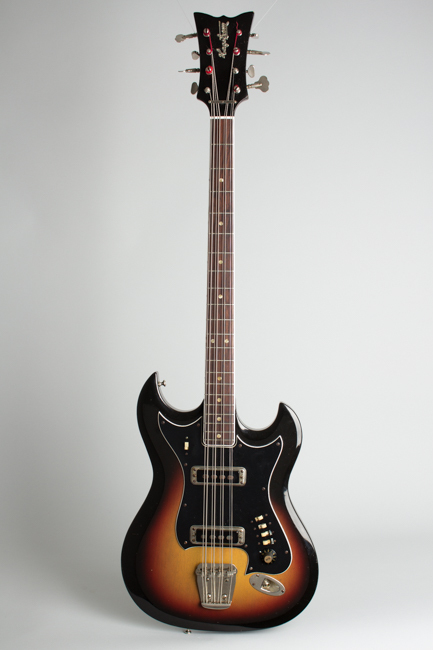 The H-8 was popular briefly in the late '60s, notable in retrospect for appearing on several Jimi Hendrix cuts played by both Noel Redding and Hendrix himself. The admittedly specialist instrument saw some success but slipped out of production by the '70s and is fairly rare today. The sound is unique and in some ways underappreciated. In the late '70s, Cheap Trick took the idea to further extremes with Tom Petersson's 12-string basses. The Hagstrom H-8 remains one of those under-utilized sonic gems, still waiting to be fully exploited and appreciated! Overall length is 43 in. (109.2 cm. ), 14 1/8 in. (35.9 cm.) wide at lower bout, and 1 1/4 in. (3.2 cm.) in depth, measured at side of rim. Scale length is 30 1/2 in. (775 mm.). Width of nut is 1 3/4 in. (44 mm.). This is a very nice example overall, with some light wear. It remains original except for a replaced volume knob. The finish has some small dings and chips, mostly to the edges, but no major wear. The neck has been refretted with the original style wire; there are no other repairs or alterations. 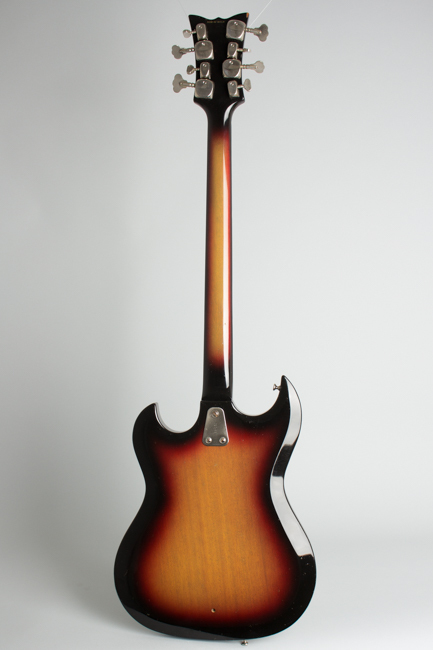 Everything works as intended, except the "Kill" switch on the upper bout has been disconnected (many players do this as it can shut the bass off unintentionally, often at inconvenient moments!). 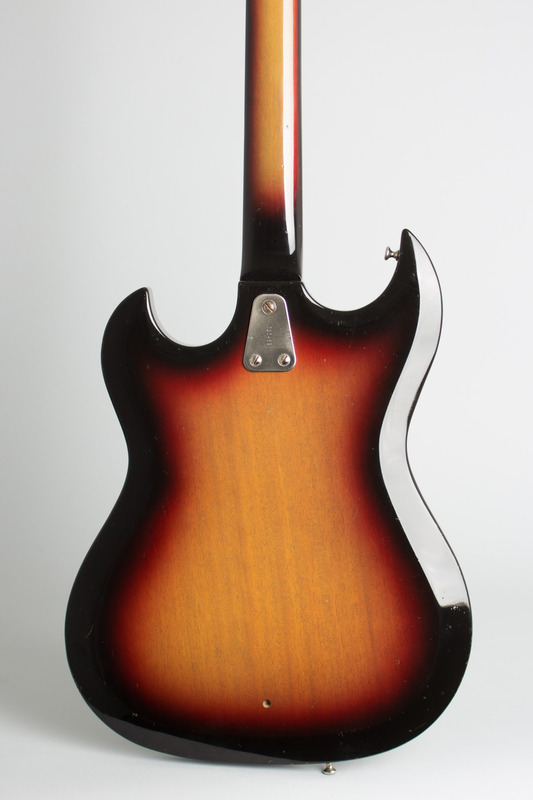 The neck is excellent and this is a very playable and great-sounding example of this pioneering instrument, complete in its worn but functional original heavy chipboard case. Excellent - Condition.